Leo man likes to comb his hair backward, open his forehead showing dignify facial expression. His eyes are sparkle, but slightly showing laziness. He walks firmly and slowly like a lion, confident and ego proud. Outside, you may think he is kind and gentle person, but inside he is a strong and secure person. If he is frightened, he will re-act and respond right away. His words always seem normal but mostly imply “order and demanding”. He will not talk fast, or can not talk fast, neither walk fast. In a crowd or at work he will act normally, but not for long you will see him standing out of the crowd and be a center of attention with his words, or his action. You might think he is a shy guy, but deep down inside he wants to power over his family and his friends. He just waits for that right moment. Do not take what is his, and do not order him, or else you will see a fierce lion. He respects elderly and senior, but will never bow down and accept like a looser for he will rather die than loose his dignity. He talks bluntly even on an occasion that he should not say such thing. He is a compassionate guy and always looks at other people on a bright side. He likes people to listen to him. Even he has such a blunt and bold personality; he could easily reach his goal without making any enemy. Once disagree with him on something, he can be very up set like a rainy storm on a summer day. It will only last a short time, and then he will be back a cheery merry person again. He is a bright and witty guy, and he will not put any efforts on something that he thinks it will not work and waste his energy. 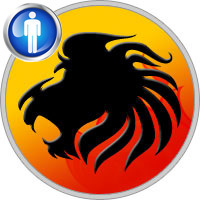 Leo man is a good planner and can well manage his job assigned. When he gives order, he expects them to be carrying out exactly. He is the leader type that the followers love. He can give other people advice and solve problems for other people well, except his own mess. He can be easily hurt by other people especially if you do not trust or respect his ability. You could compliment him sometimes and make this lion be your kitty with no difficulty. He is not a good judge for he listens to many people and tends to belief all sides. You can hardly see a Leo man with no woman by his side. If you see him alone, he could already have a love one in his heart, or just broken up with one. Because he is very proud, he can change many girl friends. He will do many things for the woman he loves, but loosing his face is not one of them. Leo man can not live without love, because for him Love is a ray of Light. He likes people to rely on him, its make him feels “in power”. He may complaint if he is asked for favor, but deep inside he is happy that you asked him. If you offer to help him, he will refuse you right away. When he is broke, he can find money still. He is not careful with his way of spending for he has fun with spending money and happy to buy what he likes. He lets other people borrow money from him easily even if he has no money, he will run to his friend to borrow money for you. He likes first class, first quality of everything. He can work hard like a mad dog, and sometimes can be lazy like a lazy sleepy cat. When he works, he is very serious. When he parties, he can be a party animal. If he asks you out, you will sure have a fun and jolly time. He will take chance with his love life, so if you know how to handle him, you will win. If he is your love one, it won’t be a romance novel. You have to be ready to calm him down when he over reacts to small matters because your cool stability will control and ease his mood. If you can not handle or understand him, your relationship will be like a demolition zone, an on and off relationship till all your friends tired to hear about your breaking up and making up. Beauty is always in the eyes of the lion. You have to be dignified to walk with the lion king. Your looks are part of his image and ego and he is very proud about it too. If you want his attention the first time you meet, you better be astounding attractive. If you have a first conversation with him, you have to show him how much you adore his thinking. Leo male likes to talk and not knowing that he likes to talk about himself.